If you are looking to get into a good shape then be serious with the Marcy Combo Smith machine. This all-in-one home gym offers almost everything you need to tone and strengthen all major muscle groups. Marcy’s Combo Smith machine uses a Smith-style pressure bar with adjustable safety stops that allow you to perform a variety of powerful workouts. It also features a self-propelled pulley system that allows cable crossovers. You will get a pull bar to increase mass in the upper back. The total leg developer will allow you to strengthen the major lower body muscle groups. The multi-purpose back pad feature will give you a safe and customizable training experience. Four convenient storage stations make it easy to organize your Olympic weight plates. 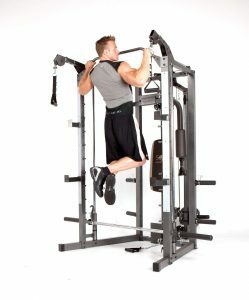 With its 14 gauge square steel tubes, the Marcy Combo Smith machine offers a very solid construction that will provide years of intensive use. Provides a full body workout. You will get a safe and comfortable workout experience. Conveniently placed safety catches allows great strength training workout. Conveniently placed footplate prevents damage and injury. You can easily do a number of crossover workouts with the two crossover pulleys. Through total leg developer, you can bulk up all major lower body muscles. Four conveniently placed storage posts offer a great way to store your Olympic weight plates. Includes V bar, triceps rope, shiver bar, chain link, ankle strap, and two handles. You can use the multi-function bench with dumbbells or in combination with the Smith-style system. Frame: 2 years. *Warranty applies to the original owner only. Depending on where you purchase from and what type of delivery you prefer the shipping costs will vary for the Marcy Combo Smith Machine. However, some retailers like Amazon.com may provide free shipping. The Combo Smith Machine comes with a lot of nuts and bolts. That’s why it will take a long time to assemble. But when it is ready you will definitely enjoy working out on it. Have patience and you’ll get through it. You get a ton of workout options with this Marcy Combo Smith Machine. 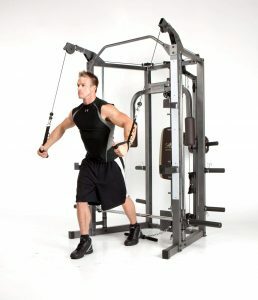 At this price, the Marcy Combo Smith Machine will give you almost everything which is tough to beat. Every exercise that you usually do in the gym, you can do so here on this machine. You have the flexibility of a smith machine, pulley machine, or free weights. with all these three systems, you will also get pec fly station to work your chest. To work out your legs there’s a leg developer attachment. You can also use the smith machine for squats. The high and low pulleys of this home gym machine are great for working out your back. Even with all of these workouts, you still get more options if you choose to pull the adjustable bench out and use dumbbells. With this awesome Marcy Combo Smith Machine, you’ll never need another piece of exercise equipment. 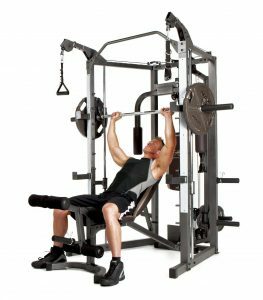 Do not get us wrong, Marcy Combo Smith Machine works well and is what you should expect in this price range. There are some things we can point out that could be better. First, if you are tall, this machine can restrict some of your movements. For example, longer legs make working with the leg developer a bit difficult. The use of upper pulleys for cable crossings may not provide a sufficient range of motion for higher users. It is evident in the functionality of this home gym that was designed for the average user. Another problem that could be better is the movement of the smith machine. However, it works nice, but it’s not as easy as some would like. This is most noticeable when performing squats if you do not have the bar completely horizontal. These are just some areas of opportunity for Marcy in future versions of Combo Smith Machine. Like many other home gym machines that use weight plates, the most obvious drawback is that the weights are a separate purchase. Therefore, not only is he offering an investment for the machine, but he will also have to open his wallet to place weight plates that fit this gym. This can increase the price of your home gym quite quickly and may make you consider buying an improved weight stack or a resistance bar gym that is ready to go directly from the box. A couple of alternatives on this avenue are the Powerline BSG10X Home Gym or the Bowflex Blaze Home Gym. Be sure to check our comments on these machines. This Marcy Combo Smith Machine offers you more workout options than you’ll ever need. The machine itself provides exercises through pulleys or Smith machine movements filled with weight plates, or you can always pull out the bench and train with weights. This machine will give you the full body training you are looking for. One caution that you will expose is that if you are a tall person, you may not get the full functionality and movement of the exercises from this machine. If you are taller, you may want to try this gym at home before making the purchase.